Numerous cross sections of the Lower Devonian interval of the central Appalachian Basin (Abel and Heyman, 1981; Diecchio and others, 1984; Harper and Patchen, 1996; Opritza, 1996; Patchen and Harper, 1996) demonstrate that the Oriskany Sandstone interval is generally continuous. The Oriskany has been interpreted as a transgressive sand unit (Diecchio and others, 1984), and these types of sandstones tend to be highly continuous. However, the upper boundary of the Oriskany is an erosional unconformity, which resulted in significant thinning and, in places, removal of the sandstone unit (Abel and Heyman, 1981; Diecchio and others, 1984). To characterize sand-body continuity, we used the map of Diecchio and others, (1984; their fig. 4), which shows a combination of formation thickness and sandstone percentage. Specifically we characterize sand-body continuity as generally good for areas on this map where the formation is more than 50 ft thick and sand content is more than 50 percent. 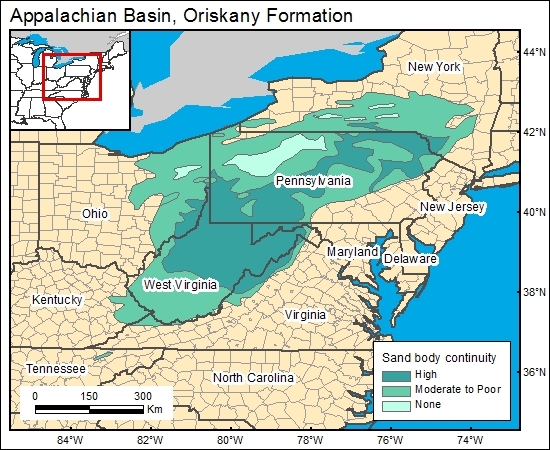 Other areas of Oriskany where the unit is more than 50 ft thick and/or shale and limestone content is more than 50 percent, sandstone continuity is mapped as fair to poor. Note that areas along the western and northwestern boundaries of the mapped generally-good-sand-body continuity may also have good sand-body continuity; sand intervals in these areas are only slightly less than 50 ft thick. The abundant geophysical well logs can be used in specific areas to further define sand-body continuity.